An exciting read about a modern-day problem. When poverty strikes eleven-year-old Gopal, he and his family move from their rural village to the city of Mumbai. But Gopal's father goes missing, and in an attempt to find work Gopal suddenly finds himself as a child laborer in a cruel man's sweatshop. Over the span of several months Gopal develops a plan for him and the other boys stuck with him to escape to freedom. Multiple times throughout the story, Scar (the cruel man supervising the children) sends Gopal outside the sweatshop for errands. Gopal could've escaped during these errands but doesn't because he does not want his friends beaten. 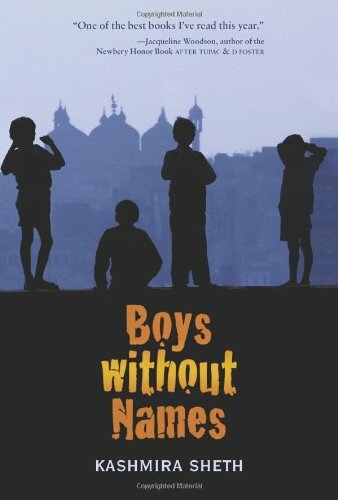 Over time, Gopal leads the six boys from fighting and threatening each other to a trusting group of supportive friends. Although there are two evil characters, most of the grownups in the story are people with character. The bad characters are painted in a clearly negative light. Plenty - Hinduism is (obviously) a huge part of Indian culture, and references to Hindu gods are continuously made, whether in the form of fables or by mentions of festival days. Scar is superstitious and believes Gopal has powers to harm him. Scar slaps, punches, whips, kicks, and shoves Gopal and his friends. To his credit, Gopal always restrains himself when wanting to hurt Scar back. Gopal is drugged and then taken to the factory. A great read about a tragedy that happens around the world today: child labor. This book draws you in and makes you cheer for Gopal and his friends, and offers the lesson that friendships and hope are powerful things worth fighting for. The book also has a glossary of various Indian phrases and offers a glimpse of Indian culture.